Back in the days, the UAE was a vast desert land divided into seven emirates - Abu Dhabi, Ajman, Dubai, Fujairah, Ras Al Khaimah, Sharjah, and Umm Al Quwain, and each emirate had a different Sheikh (leader). In the 1950s, the British came to the UAE and oil was discovered in this land. In December 1971, the leaders of the seven emirates held a meeting at the Dubai Guest Palace (now known as the Union House) and decided to form one nation that is the United Arab Emirates, having His Highness Sheikh Zayed bin Sultan Al Nahyan as the first President. Fast forward to 2013, the UAE is now one of the most progressive countries in the world. Their economy is sky rocketing high, the tourism industry is continuously on the rise, and definitely the UAE has made its mark on the globe with Burj Khalifa, Burj Al Arab, Emirates Palace, Yas Island, etc. 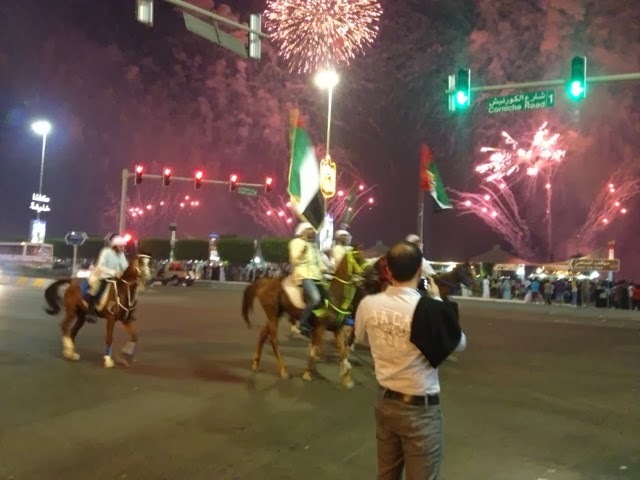 Every 2nd and 3rd of December each year, the UAE National Day is celebrated to commemorate the union of the seven emirates. When I first came here in 2004, the celebrations were not as grand and extravagant compared to what we have had during the recent years. 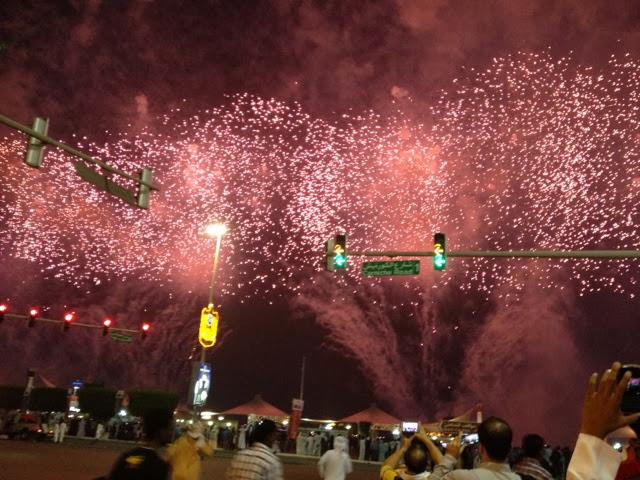 Now people are expecting fireworks display in each corner of the UAE. Mind you, the fireworks are not simple - they are extraordinary. The government is really spending thousands of dollars for the fireworks display, believe me! 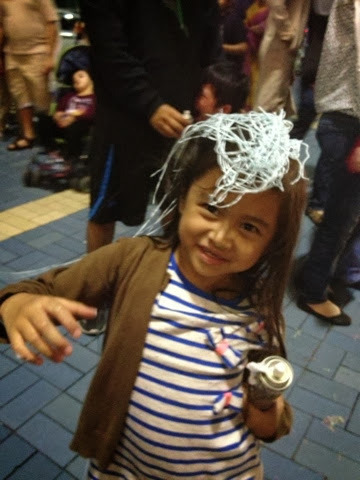 It has also been a tradition for the locals during the National day to pimp up their rides. Just look at this picture below. The car was pimped up as with crystals. It was really eye catching. 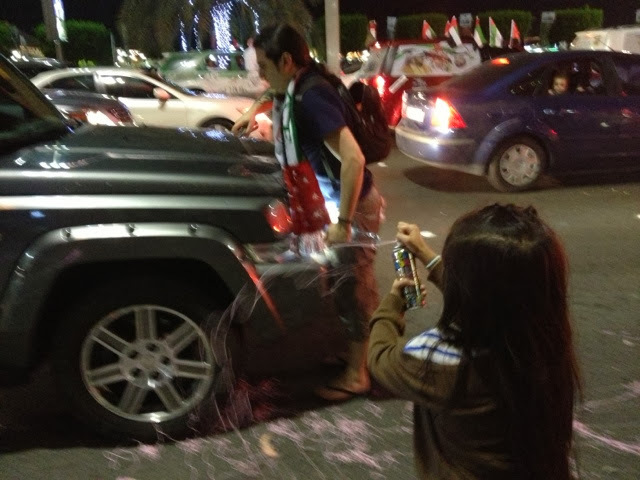 Some had their cars with stickers of the UAE rulers on, some use flags, etc. Crazy? Yes! 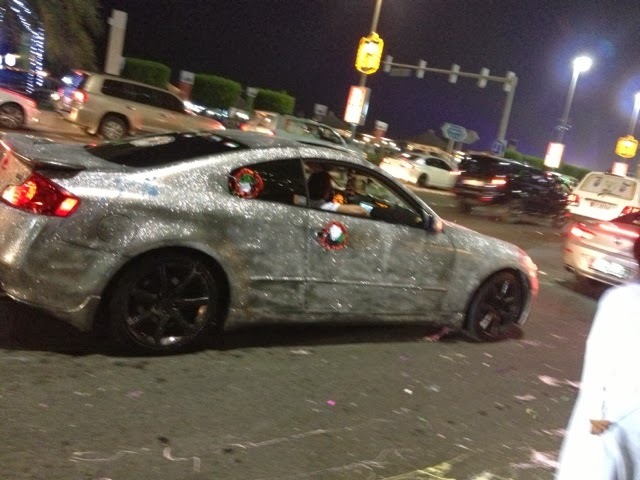 But I will go crazy dressing up my car, too, knowing that you could win over AED 100,000 (USD 27,000). And of course, if you're driving on Corniche Road expect heavy traffic and that your car will be sprayed with snow spray and crazy ribbon. Warning: Don't be mad if you got sprayed, it's common during these two days to be a victim! It's really a delight to see how patriotic the locals are during the National Day. Who wouldn't be? The UAE government has really taken care of their people very well and if I were a local myself, I would be more than proud of this country. UAE has been my second home where I have built my family and dreams, for which I will be forever grateful for. Cheers, UAE!